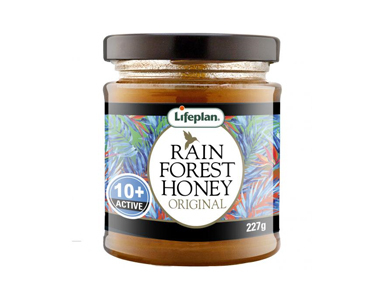 We sell Lifeplan products like The Active Honey Co Rainforest Honey 10+ Active online in the UK and directly from our award-winning store in Scotland. This unique, premium and natural product is harvested from the spectacular Validivian rainforest, where bees produce honey from some of the world's oldest trees. This special area of the rainforest is protected and provides extra income for the indigenous Mapuche people. As official Lifeplan stockist, we sell genuine Honeys directly from our shop in Scotland and online throughout the UK. Where can you buy real Rainforest Honey 10+ Active safely online? If you are wondering where you can buy The Active Honey Co Rainforest Honey 10+ Active safely online in the UK, then shop with us. We are an actual health foods shop; with real people selling real foods and products. Our award-winning independent shop is located in Stirling, Scotland since 1976. You can buy our Vitamins, minerals and supplements and other genuine Honeys in store or safely place an order with us online or over the phone. Rainforest Honey 10+ Active - The Active Honey Co Rainforest Honey 10+ Active in Honeys and Honeys, Jams & Spreads.